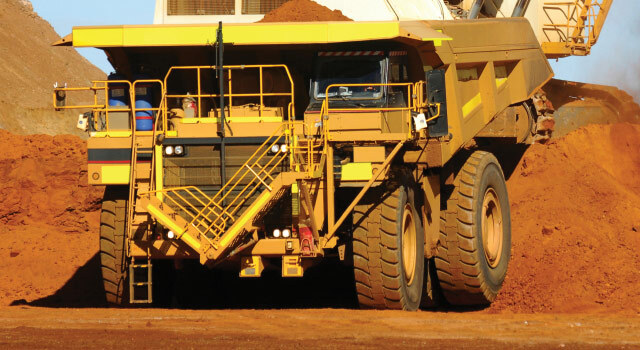 The Hydex Tyre Monitoring System - HyTrack is more than just an in cab tyre pressure indicator, this real time system not only alerts the machine operator to dangerous tyre situations such as low pressure, or extreme temperature but is is also fully configurable so that the right people know the tyre status of the machine. Both fuel efficiency and tyre life are greatly improved through the proper management of tyres, our system will e-mail or send an SMS to the maintenance department if a tyres pressure is a little low, so that it can be checked and inflated at the change of shift, or if a machine has a total deflate or is at risk of pyrolysis managers and supervisors will be automatically notified so action can be taken, saving tyres and potentially lives. This versatile system can be installed on virtually any machine with rubber tyres. 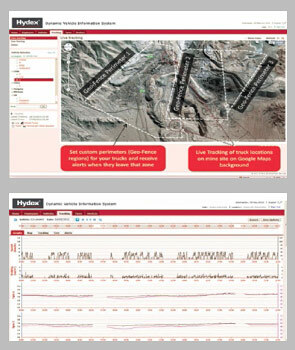 Hytrack provides real time machine tyre data, speed and braking data and GPS position, this information is collected and stored on our dedicated servers so is available to managers and owners 24 hours a day from anywhere in the world with an internet connection. Haul roads can be mapped, enabling alterations to improve truck speed and safety. 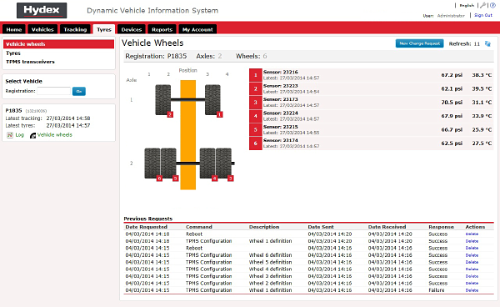 When combined with the Hydex WMS you will be able to see what payload your trucks are carrying, where to and how often, giving you access to how your machines have been working and helping identify arrears of improvement, all to help you get more production, more safety, and more revenue from the machines you already have.